Note: The source for the information below is the 2010 ADA Standards for Accessible Design. Shower Compartment Seats - Where a seat is provided in a standard roll-in shower compartment, it shall be a folding type, shall be installed on the side wall adjacent to the controls, and shall extend from the back wall to a point within 3 inches (75 mm) of the compartment entry. Where a seat is provided in an alternate roll-in type shower compartment, it shall be a folding type, shall be installed on the front wall opposite the back wall, and shall extend from the adjacent side wall to a point within 3 inches (75 mm) of the compartment entry. 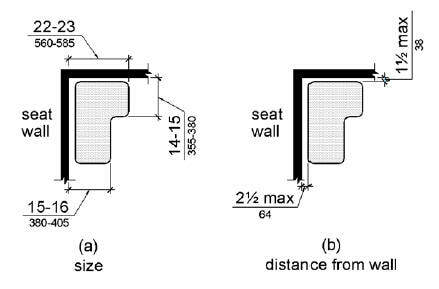 In transfer-type showers, the seat shall extend from the back wall to a point within 3 inches (75 mm) of the compartment entry. The top of the seat shall be 17 inches (430 mm) minimum and 19 inches (485 mm) maximum above the bathroom finish floor. Seats shall comply with 610.3.1 or 610.3.2. Rectangular Seats - The rear edge of a rectangular seat shall be 2 1/2 inches (64 mm) maximum and the front edge 15 inches (380 mm) minimum and 16 inches (405 mm) maximum from the seat wall. The side edge of the seat shall be 1 1/2 inches (38 mm) maximum from the adjacent wall. L-Shaped Seats - The rear edge of an L-shaped seat shall be 2 1/2 inches (64 mm) maximum and the front edge 15 inches (380 mm) minimum and 16 inches (405 mm) maximum from the seat wall. The rear edge of the "L" portion of the seat shall be 1 1/2 inches (38 mm) maximum from the wall and the front edge shall be 14 inches (355 mm) minimum and 15 inches (380 mm) maximum from the wall. The end of the "L" shall be 22 inches (560 mm) minimum and 23 inches maximum (585 mm) from the main seat wall. Structural Strength - Allowable stresses shall not be exceeded for materials used when a vertical or horizontal force of 250 pounds (1112 N) is applied at any point on the seat, fastener, mounting device, or supporting structure.